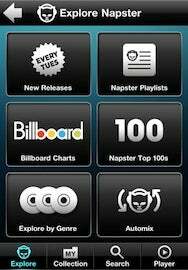 On Monday, music-subscription service Napster launched an iPhone app that streams 10 million tracks from its catalog. The app lets you save songs and playlists for listening offline, and offers access to the Billboard charts going back to 1955. Reborn as a pay service after its late 1990s heyday as a music pirate’s best friend, Napster’s a solid subscription service, although it’s been slow to release an iPhone app. In addition to saving up to 100 songs on your iPhone, Napster does offer an “automix” feature that works like Genius in iTunes, creating playlists based on your preferences. Of course, you lose the music saved to your iPhone if you let your subscription lapse. The free Napster app requires iOS 3 or later, and works with the iPhone, iPod Touch, and iPad (but it’s not a universal app). To use it, however, you’ll need a Napster plus Mobile Access subscription, which costs $10 a month and gives you unlimited, on-demand streaming on your mobile device or through a Web browser. The company is also offering a discounted annual plan for $96.